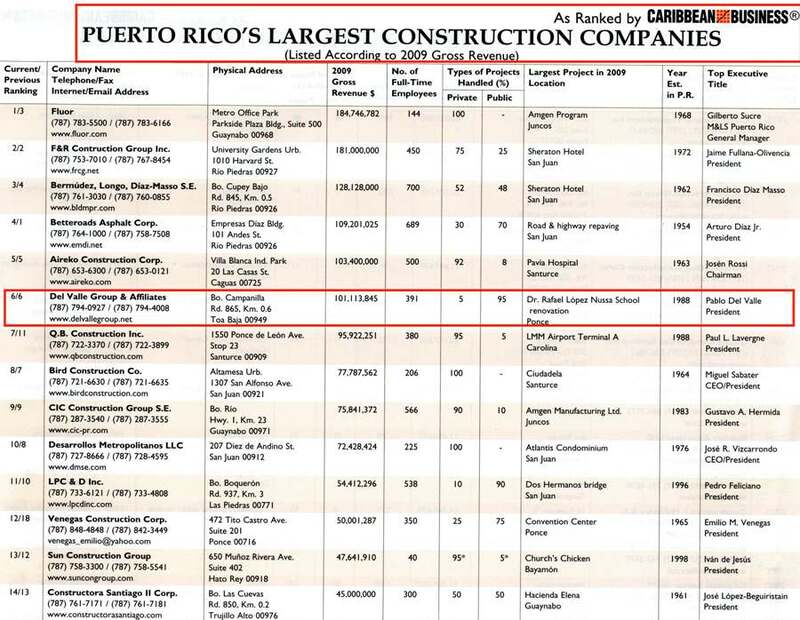 DVG is member of The Associated General Contractors of America, Puerto Rico Chapter. Also is member of the AGC-Puerto Rico Highwat Authority, Special Commitee. Is sustaining firm to the National Society of Professional Engineers. Since its formation in 1988, DV has become recognized as a leader in roads contructions, pavement rehabilitation, bridge constructions, buildings, site development, marine structures and facilities. In 1992, DVG was selected Contractor of the Year by the American Public Work Association. In 1998, Eng. Pablo Del Valle, PE, DVG President, was elected Puerto Rico Chapter President of the Associated General Contractors of America. In 2003 DVG was awarded The Construction of the Bridge over Río Grande de Loíza, as part of Route 66 on the Eastern side of the island. In 2006 DVG was awarded The Phase II for the Construction of a Container Parking Facilities Expansion in The Puerto of las Americas Project. In May 2010, DVG was recognized by the United States Department of Commerce, Minority Business Development Agency, New York Regional Office and National Office, with the “Minority Construction Company of the Year” Award. As January 2011, DVG has completed successfully 197 projects for a total amount of $878,664,317.